Maui Jungalow: War on Ants! The many critters and bugs in Hawaii can create a challenge to keeping a clean home free of insects. Most areas rely on the winter "freeze" to kill off the bug population. Unlike the mainland, Hawaii is temperate year round and the bug population continues to increase. I waged an all out war against the ants this year when I removed a loose piece of my skin from a wound while I was cleaning it and set it on the counter only to find it moving along the tile moments later. No, I wasn't high! There were a dozen ants carrying their newfound "food" away! A ring of ants discovering food and crumbs. Ants can be a real challenge, especially in dry weather. Oftentimes on the dry side of the island, such as Kihei, the ants come in looking for water more than food or anything else. Line of them can be found headed for the sink or toilet (Ouch!). Keeping things dry helps keep them outside the house. Wiping the sink and counter with a dry rag and using a squeegee in the shower can help to reduce the attraction. I find it helpful to trace the ant trail to locate its origin and final destination. The destination tells me what they are after, usually water or a tiny crumb that wasn't wiped up. They may also be headed for the cupboards where there's food. A wet soapy rag or spray of vinegar on their trail disrupts their scent trail. They may act confused for awhile and run around in various directions. Eventually they reestablish the trail, but it if is disrupted several times they eventually go away. Looking for the origin of the ant trail. When I locate the point or origin, usually a tiny hole, I pack slightly moistened baking soda or borax into the holes they come through. They don't like that and go elsewhere, even though they may dig through once or twice before giving up. Using boric acid in the same way would kill them if they dig through, but watch out for the pets and kids! Ants don't care for mint, so leaving some where they frequent helps too. I find they often just avoid that area and go around it though, so it might require making a solution of mint essential oil to spray around the affected areas to deter them. Diatomaceous earth sprinkled around is another non-toxic solution. It's like a crystalline powder that has tiny razor sharp edges that cut the ants bellies when they crawl on it. I think it dehydrates them too and they die as a result. Most important, keep food in the fridge or well sealed glass jars. They'll even eat through packages stored in the pantry to get at the food and food packaged like this acts as bait. I never leave open packages in the pantry. Fruit bowls can be an attraction too. Oddly, I find they avoid my fruit bowl. If they do get into it, I fill a larger bowl with water and place the smaller fruit bowl inside of it to create a water moat that the ants have to swim through. That helps to protect the fruit. The downside is that standing water is attractive to mosquitoes who like to lay eggs in it, so put some dish soap in the water or change it daily. 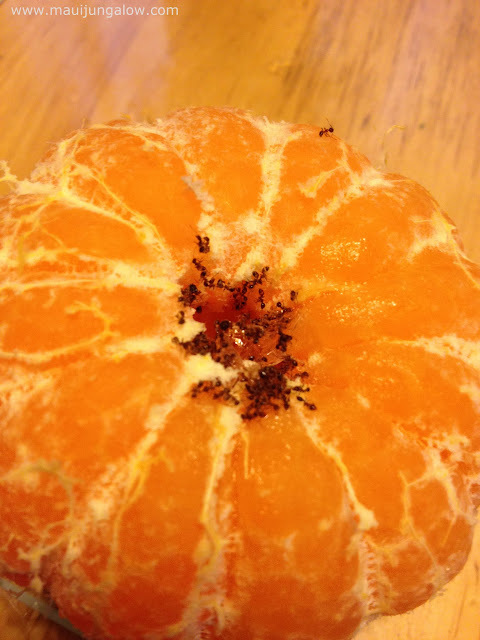 Ants like oranges and tangerines. These ants have been secretly eating this Asian pear in the fruit bowl. The hole was on the bottom, hidden from view. My biggest problem is the water crock. They crawl up the spout and over the edge to get at the water. They don't drown in it either. They collect in clumps and hold each other afloat for days! I use a net strainer to remove them when I change the water crock. Wiping down the outside of the crock with vinegar or a soap solution helps to keep them away too. When dispensing water, I always drain a tiny bit to be sure no ants are in the spout (and my water!). Then I fill my glass or bottle. Though I prefer water room temperature, if the crock is too full of ants, I just store the crock for the summer and use one of the blue dispenser bottles on the refrigerator shelf. Then I bring it out in the winter and rainy season when the ants are busy wrecking havoc elsewhere. When all else fails, I apply a line of boric acid around the perimeter of the house (apply when it's not windy). Boric acid can also be mixed with sugar and water in a paste and placed on a shallow surface near their trails to kill them, but the sugar will else attract them first bringing them in. Good luck with the buggies! Did you enjoy reading this post? If so, consider signing up for a monthly-ish newsletter of blog posts and information.